1) Preheat your oven to 450°F. As the oven is preheating, place the 8 tablespoons butter in a 9" x 13" pan, and put the pan in the oven to melt the butter. When the butter is melted, remove the pan, and sprinkle in the minced garlic, stirring gently to distribute. 2) Stir together the flour and milk to make a soft dough. Gather the dough into a ball, and gently fold it over three or four times. 3) Place the dough on a well-floured surface, and roll/pat it into a 10" x 8" rectangle; it'll be fairly thin. 4) Cut the dough in half crosswise, into two 8" x 5" rectangles. Cut each rectangle into 16 sticks, about 5" x 1/2" each. 5) Lay the sticks close together in the pan, turning them to coat with the butter; you'll need to snug them right up against one another. 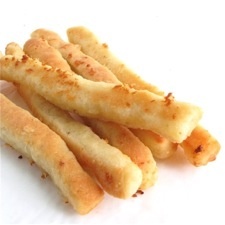 6) Bake the sticks for 15 to 20 minutes, until they're a light golden brown. Remove them from the oven, and as soon as you can handle them, gently pull them apart and place on a plate or in a basket. Serve warm. For an even quicker and easier treat, simply use a tablespoon cookie scoop to drop the biscuit dough into the garlic-butter in the pan, flattening them to (mostly) cover the bottom surface. Bake as directed.